Yamaha Music Vietnam Co. Ltd.
Hanoi, Vietnam—Yamaha Corporation and Yamaha Music Vietnam Co. Ltd. signed a memorandum of understanding (MOU) regarding promoting instrumental music education more widely in Vietnam on October 13, 2017 with the Ministry of Education and Training (MOET) of the Socialist Republic of Vietnam (hereinafter, Vietnam). The MOU was signed at the Vietnam MOET in Hanoi in the presence of representatives of Japan's Ministry of Education, Culture, Sports, Science and Technology (MEXT) and the Embassy of Japan in Vietnam. 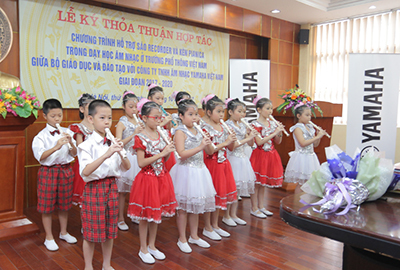 The signing ceremony also included a recorder performance by local Vietnamese primary school students to celebrate the conclusion of this MOU. The recently concluded MOU will facilitate Yamaha's implementation of these activities that it has conducted thus far. Yamaha aims to introduce instrumental music education into the revised "Course of Study", and to proceed with creating model examples to place these initiatives on a firm footing for further development. Specifically, with the recognition and approval of MOET, the MOU will make it possible for Yamaha Corporation and Yamaha Music Vietnam to form music clubs making use of recorders and pianicas in 245 primary schools in 10 cities nationwide in Vietnam over the approximately three-year period from October 2017 to September 2020. Over this period, Yamaha is planning to provide recorders and pianicas to the primary schools as well as hold seminars for instructors and sponsor music festivals. Following the recent signing of this MOU, Yamaha Corporation and Yamaha Music Vietnam will implement even stronger initiatives to place the introduction and spread of instrumental music education in Vietnam on a sound footing. Through these activities, we are committed to creating excitement and cultural inspirations. Primary school students perform on recorders they have learned to play in local music clubs. Yamaha Corporation and Yamaha Music Vietnam have promoted cooperation with Vietnam in the field of music education. I believe that this cooperative program will be implemented well, bringing benefits and greater efficiency to Vietnamese primary school students. I am looking forward to the further development of educational cooperation between Vietnam and Japan. Japan's relationships with Vietnam are becoming more and more important. This is evidenced by the conclusion of a MOU between Vietnam's MOET and Japan's MEXT in 2014, and, in 2016, a meeting attended by Prime Minister Phuc, Minister of Education and Training Nha and then Japanese Minister of Education Hase. This was followed by Prime Minister Phuc's visit to Japan in June 2017 and the planned commemoration of the 45th anniversary of the establishment of diplomatic ties between Vietnam and Japan in 2018. Amid this chain of events, last year Japan's MEXT, its Ministry of Foreign Affairs, and other related parties began the EDU-Port Japan initiative, which is a joint public and private movement to create a framework for moving forward with cooperation in the education field with both countries on an equal footing. At this very time also, Vietnam is revising its "Course of Study". Japan wishes to give the fullest support it can to these initiatives, while Yamaha, working in collaboration with Yokohama National University, is endeavoring to transfer its know-how in Japan's instrumental music education. MEXT has given official recognition to the project. 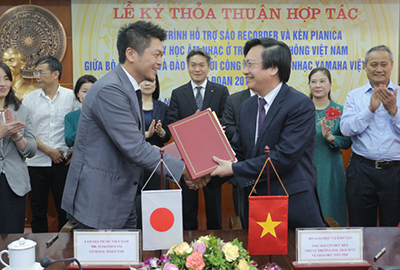 As a result of the recent MOU, Japan is looking forward to the stepping up of the recorder and pianica music club activities that Yamaha has been promoting on a nationwide scale in Vietnam. Comment by Makoto Tani, General Director, Yamaha Music Vietnam Co. Ltd.
Yamaha's corporate slogan is "Sharing Passion and Performance". We provide quality instruments to musicians. If there were no musicians or educators, we could not exist. In November 2015, I met Vietnamese music teachers playing recorders passionately. That passion was shared with many students, parents, and the community, and it has helped bring us here to where we are today. With everyone's passion here today I believe in the success of the program, and think more and more people will enjoy music and enrich their lives, just like the students who are sharing the joys of musical performance here today.